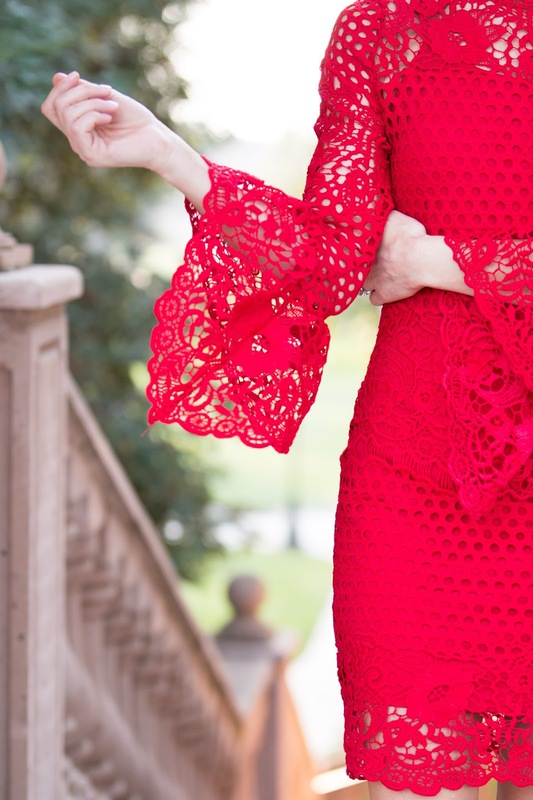 Valentine's Day is right around the corner and what is more perfect than a stunning red, lace dress. Whether you gush over all things heart or have the day pass without a thought about roses, there is always time when a pretty red dress is needed. Weddings, holiday parties or just a good date night with the hubby, a statement dress like this is never too far from reach. I love that this one not only has a high neck but has a gorgeous scallop detail. Kev and I don't celebrate Valentine's Day in the traditional sense. We never go out to dinner or buy gifts. I am not into forced placed love. Not knocking those you do love all the mushy gushy stuff, it's just not us. Plus, Kev's birthday is the week before so we get in our romantic fix then. That said, I love any excuse to get dressed up. One of my best friends had the most amazing birthday/Galentine's Day dinners at her house this past weekend and it was the perfect excuse to wear THIS dress. When choosing a red dress, especially one you can wear over and over, I tend to go towards something that is a little more modest. Red is already a statement color, no need to add a plunging neckline or ultra short hem into the mix. The sleeves are great for cooler months but also add the ultimate detail by way of bell sleeves and intricate details. The slip underneath is just a few inches shorter than the dress itself allowing a sneak peak of the lace hem. If you're in the need for the perfect dress this Valentine's Day or have a wedding coming up soon, save yourself any more looking and get THIS now. It's super flattering and super affordable.